- Miniaturization design, input & output port using horizontal row. - Dual battery input design, automatic switching and balancing between.batteries. - 4 current outputs, support 4 channel servos direct connection. - Plug and play. No need to weld the connectors. - Internal dual input voltage monitor for low voltage with memory function. - Support HV servos (7.4V), output voltage is switchable. -.Includes FSS-3, the failure safety switch with status indicator (#46813),.VR Pro Duo also supports FSS-4.lightweight switch(#46814). - Equipped with heat sink and external cooling fan (#46816). - Support up to 10pcs of 30kg digital servo. 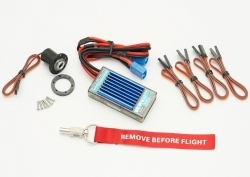 - Can be used on the largest 13KG model aircraft, eg.120CC Gasoline.Powered Aircraft. - Linear regulator, no interference, low ripple. - The input power uses simulated diode dual redundancy power supply. - Double MosFET output, independent linear control IC, high output current.capability. - Low dropout design makes fully use of the cell's capacity, especially on.HV mode. - Large heat sink, good heat dissipation and high overload capacity. - Built-in MCU precisely controls FSS-3 and internal voltage. - Fail safe design, ensuring Non-stop work. - SMT process, ensureing the quality. - Input & output port all use high quality tantalum capacitors. - Dualsky Shanghai factory assembled, fully tested before dispatch.